Turmeric is fast becoming a popular remedy for just about everything that ails you. I became an avid enthusiast on a trip to Kauai when I actually had access to the fresh root for the first time. 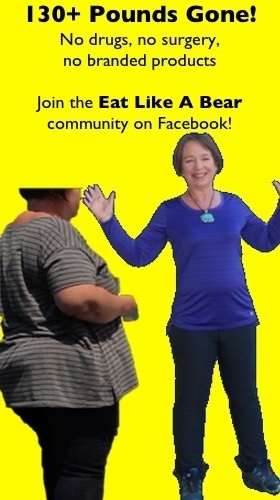 I was recovering from a drastic dermatological procedure and it was not the optional sort — I had cheek skin grafted to my nose in the doctor’s effort to find a piece of my skin not invaded by basal cell skin cancer. (As an aside, if you drink this golden milk in the sun, be sure to wear a giant hat….) In any case, on that Kauai trip, I needed extra care and nourishment and this is one of the ways I took care of myself — experimenting with all things turmeric. When I returned home, I found that the golden milk drink is particularly powerful as a wintertime cold and flu remedy. I have added some to just about every tea I have put together this past season. Turmeric in milk is a great option as well. The flavor is pleasant and offers a change from the tea. Beyond the western research, there are centuries of tradition using turmeric to cure all that ails you. As you explore the topic yourself, Ayurveda and Unani systems of medicines in India have used turmeric in health and wellness since for as long as records even exist. Read a detailed article about turmeric on the Fresh Bites Daily website here. Golden milk is extremely simple. I use the ginger for flavor but it fights the same sorts of ailments. It’s critical in this mix to mask the bitterness of the turmeric and it brings health benefits to boot. If you have fresh turmeric or ginger, by all means use those but I definitely reuse them. I would tend to rinse them and use them in a new batch of tea. You could make more golden milk as well. Place 2 cups of milk in a saucepan over medium heat. Stir well, especially if you are using the dried spices. Allow to heat for another minute or two being careful not to let the milk overheat. Continue to stir at this point to get better heat distribution and so that you don’t end up distracted in your kitchen and end up with boiled turmeric in your burner pans (*cough*). Turn off heat, cover, and allow the golden milk mixture to sit for ten minutes or so to improve the infusion. Strain the golden milk through a strainer if you have used fresh ingredients. Add honey, adjusting to taste. Serve your golden milk warm. If you find your turmeric milk drink to be overly bitter, it may be because you haven’t let it simmer long enough. If you actually boil turmeric powder, it will be far less bitter. If you are using a dairy-based milk you dance a careful dance between getting it hot enough to reduce the bitterness and too hot to burn and scald. 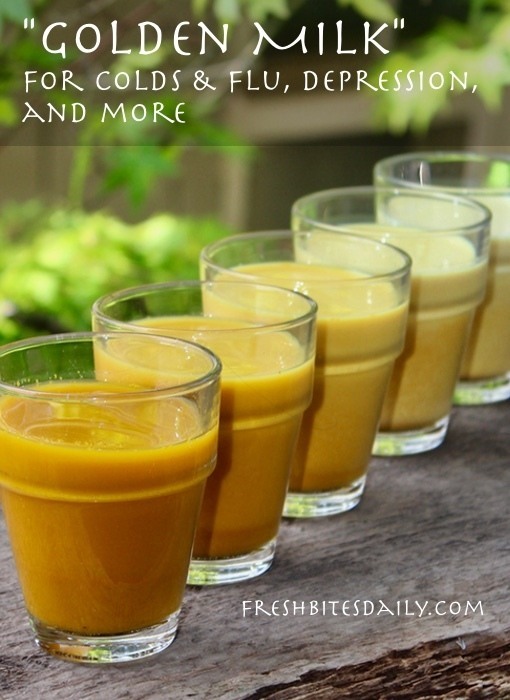 With our turmeric obsession comes a number of popular posts besides this short recipe on golden milk. All about turmeric — uses, research, recipes, and more. Find it here. Turmeric tea made with fresh turmeric root and some simple flavor options to help it come alive. Find it here. Turmeric tea paste, a great option for making tea from the powder that is also portable and easily taken on the road. 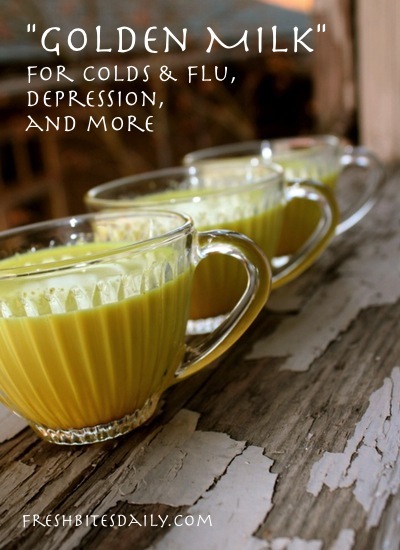 (You can also use it to make golden milk – turmeric milk.) Find it here. A turmeric facial mask with an accompanying scary photo here. 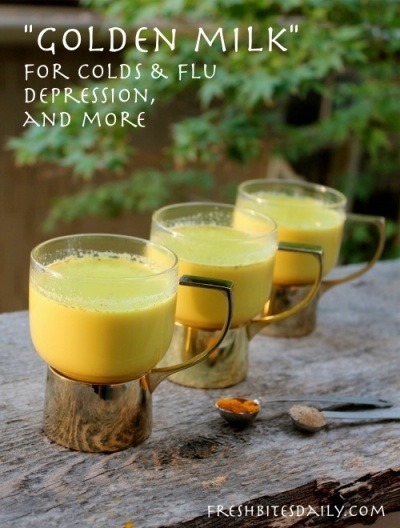 Traditionally, golden milk/turmeric milk has been used for colds, congestion, headache, and sore throats. Turmeric is a depression-fighter as well. Adding more to our diets is one great brain building strategy. Add turmeric, ginger, and pepper. Stir well. Let the milk begin to simmer. Stir. Allow to heat for another minute or two being careful not to let the milk overheat. Continue to stir.